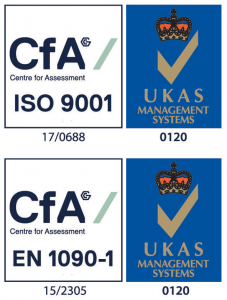 Dungarvan Precision Engineering Ltd has successfully achieved compliance with the requirements of CE Marking EN1090-1 for Structural Steel. CE Certification achievement has come after a program of investment to produce an accredited Factory Production Control system. This covers stock management, skilled personnel, fabrication equipment and workshop consumables, with continuous surveillance, inspection and testing of welds and welding personnel. Clients or main contractors who engage a steelwork contractor should carry out due diligence and should only appoint a steelwork contractor certified with an Execution Class equal to that for the project.